In my never-ending quest to acquire all of Jean Claude Constantin's designs, I recently got from PuzzleMaster the Centrale puzzle. 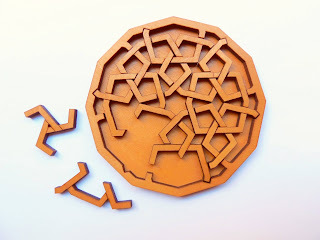 I was very curious about this design, mainly because I already had two puzzles from Robrecht Louage that have this same concept - Free a coin that's trapped in a maze. Centrale is a relatively small puzzle, measuring only 8.9 x 5.7cm (3.5" x 2.2") and, just like the designs from Robrecht, there's a sliding platform with a 5 cent euro coin that needs to be placed under the larger cut-out circle in order to free it. The mechanism is only half-visible due to the small square cut at the bottom, which lets you see two steel balls moving around, although it's more than enough to solve it without any problems. In fact, I believe the solution is given away because of this small square. PuzzleMaster rates it as a level 7/10, but I say it's no more than a 5/10. There was absolutely no challenge after I saw how the balls moved inside the puzzle. I was able to get the coin out within a couple of minutes. The only tricky part was getting the balls where I wanted them, which was more of a dexterity-based challenge than a skill-based one. Before attempting to solve the puzzle I read a few things about it, by fellow bloggers, who reported this as being a very tough challenge to solve. Obviously, I was a bit intimidated to try it, but it wasn't enough to put me off. Suffice it to say, I was very surprised to have solved it so fast, so I put the coin back in and tried again. I could've just got lucky, so I had to know if what I thought was the solution, was in fact the correct way to solve it. After a few more successful attempts, I was then sure that this was indeed the correct solution. Did you solve Robrecht Louage's 4 Steps Visible Lock? 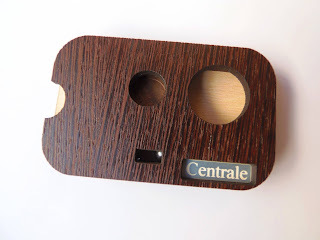 - Well, the solution to the Centrale is exactly the same as the first step on the Visible Lock, where you also had two spheres in the same positions. I was a bit disappointed to find out that the puzzle was so easy, to be honest. Here I was, expecting to have a serious challenge in my hands, just to be over in a matter of minutes. I came to know that the original design was indeed very hard to solve. The reason? - The square showing the balls is not present in this version, so you have no way of knowing how the mechanism works. You can only hear the balls rattling inside. My understanding is that, because the original version was so difficult to solve, Constantin updated the design in order to appeal to a wider audience. I just wish the end result wouldn't turned out be so damn easy. Solution: If you need the solution you can download one from here. Availability: You can purchase the Centrale puzzle at PuzzleMaster for $16 CAD. Note: The picture shown at PuzzleMaster is of the harder version, but I was sent the easier one. Make sure which version you're getting before ordering to avoid disappointment. Little things can be deceiving, and Timonen Burr is a good proof of that. This 5cm length burr puzzle will have you screaming obscenities at it in no time, as you try to remove the very first piece. 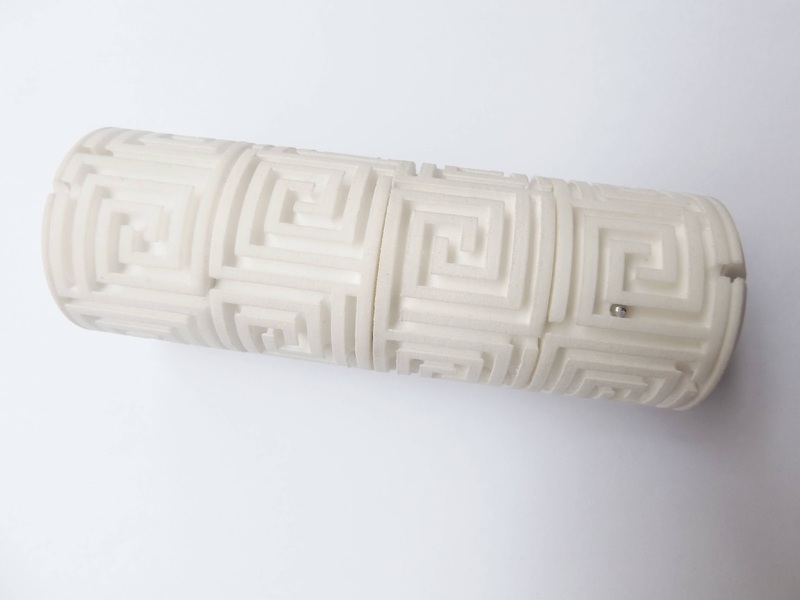 The puzzle is named after its Finish designer, Vesa Timonen, who created it in 2007. Timonen Burr is made from Sloyd's trade mark birch wood, present in all their puzzles, which gives it this beautiful light tone. The design is also a bit different from the classic burrs with six squares intercepting each other in the middle. The puzzle is comprised of six pieces with two distinct groups: the first group of three pieces is somewhat similar to the type of pieces you're used to see in the traditional burr (two C's and one G). 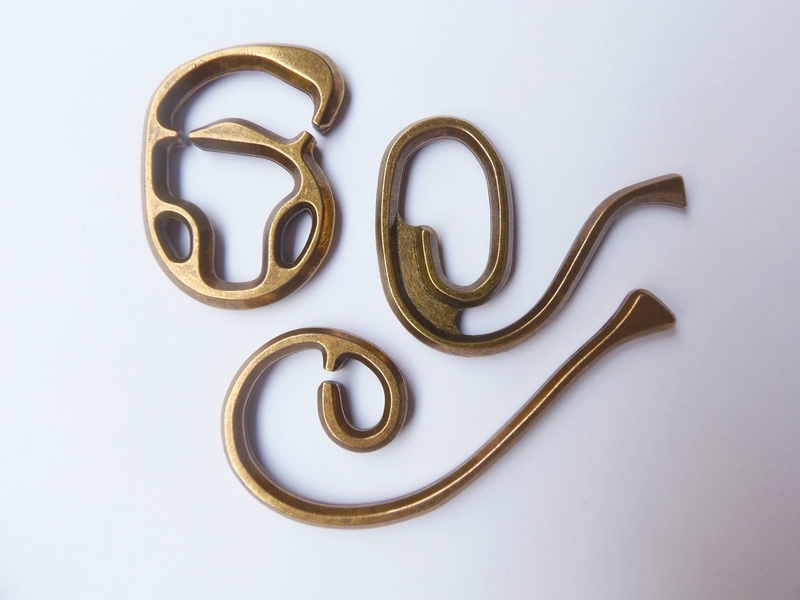 The second group of pieces, however, is what makes Timonen Burr so unique: three pieces and all different from each other (although one of them is a variation). When it comes to the difficulty level, Timonen Burr is everything you'd expect from an extremely challenging burr. Sloyd's own rating system, from 1 to 5, classifies it as a level 5 and I completely agree. It took me about 45 minutes to completely disassemble it, and 15 of them were just to remove the first piece. After that, it was a series of seemingly endless sequential movements that always led me to the same starting point. I was eventually able to remove the second and third pieces, almost at the same time, and the remaining larger three pieces followed right after with very little effort. If the challenge of disassembling the puzzle wasn't enough, you're supposed to put it back together to fully solve it. Just like my love/hate towards string puzzles, the burrs seem to fall in the same category - A pain to take apart and an even bigger pain to put it back. If you ever tried to solve a burr puzzle, then you know you have to follow a strict sequence of moves: backwards from the ones you did to take it apart. Well, this wouldn't be a problem if I could remember exactly which moves I did to disassemble it, which I don't... After the initial trial and error to see which piece would fit, I saw that I wasn't going anywhere without instructions. It still took me about 20 minutes to put the puzzle back to its original form, so you can see that even when you're following instructions, it can still be quite tricky. Timonen Burr is a "little" devil to solve, but I enjoyed particularly taking it apart. Maneuvering the small pieces might take a while to get used to, but other than that it's a highly recommended puzzle for burr lovers. Availability: You can get a Timonen Burr at Sloyd's for about €19. For other exclusive Sloyd puzzles check out their wide selection. 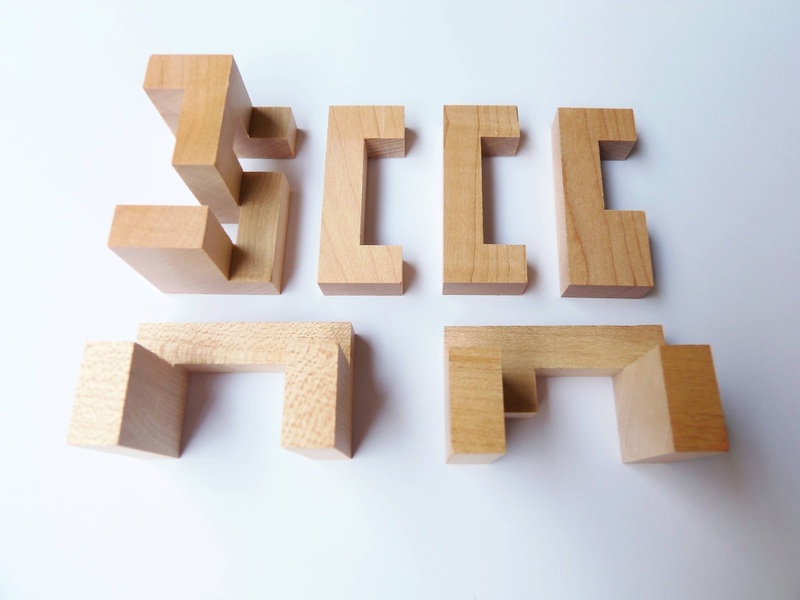 Last year, also in January, I reviewed two puzzles from Belgian puzzle designer Robrecht Louage: Remove the Yolk and 4 Steps Visible Lock (winner of IPP 2011 Jury Grand Prize). 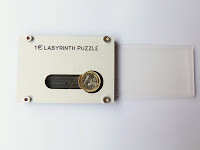 This year, Robrecht participated again in the 32nd IPP and his contribution was the 1€ Labyrinth Puzzle. It didn't win an award, but it doesn't make it less impressive than its predecessors. I loved his previous two puzzles, so I was obviously eager to try his latest design. Suffice it to say, I was as impressed as I was the first time around. 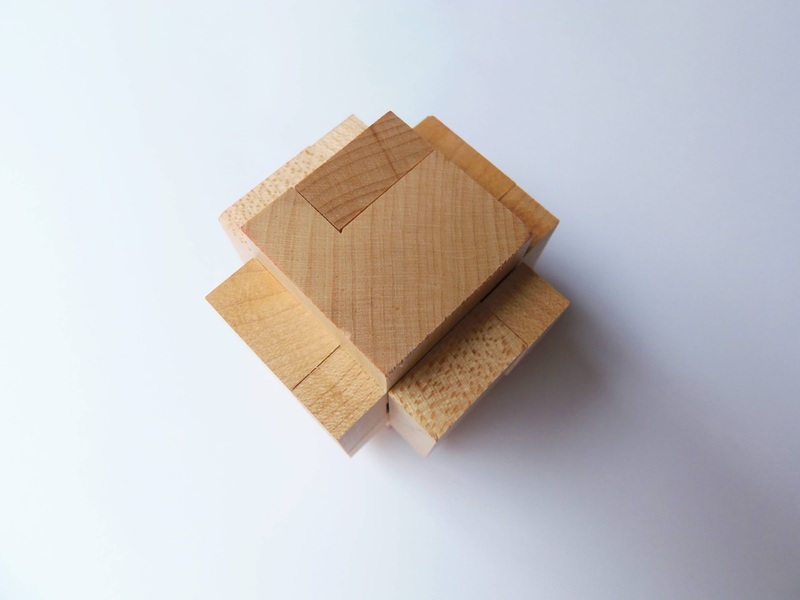 The quality and design of the puzzle are perfect, as well as its solving experience. 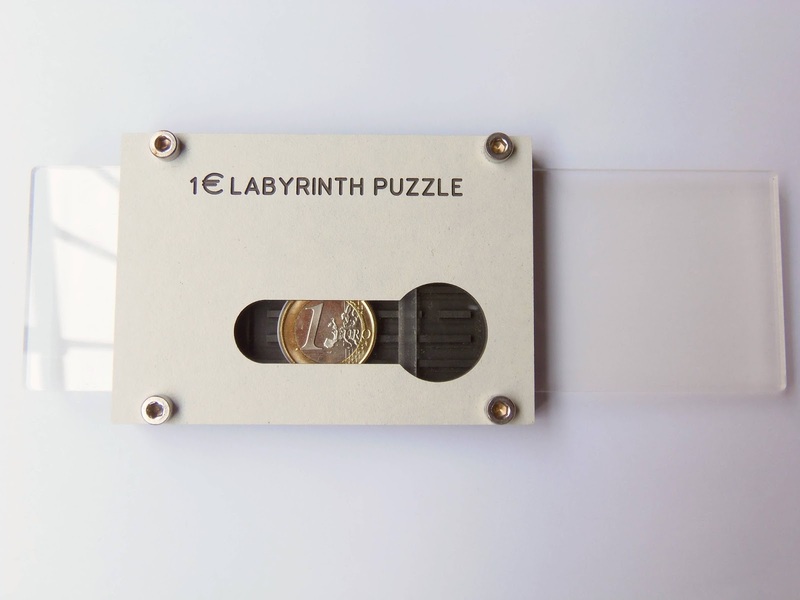 The materials used in the 1€ Labyrinth Puzzle are pretty much the same, with trespa and acrylic providing a great visual appearance. The trespa frame is relatively small with dimensions of 10 x 7cm (3.9" x 2.8"), although the acrylic platform extends its total length to 18.5cm (7.3"). 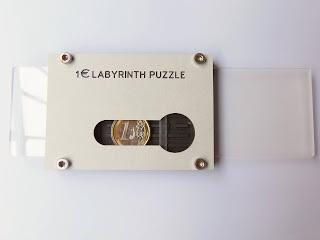 There are a couple of similarities between the 1€ Labyrinth Puzzle and the 4 Steps Visible Lock: both have some sort of maze that you have to navigate with steel balls by pushing and pulling the acrylic platform, until you're able to free the coin. While you could see the whole maze in the Visible Lock (not quite, but still 99% of it), you can only see part of it in the Labyrinth Puzzle, with the rest being up to your puzzler intuition. In all fairness, you only need to see what's shown of the maze, as you wouldn't be able to figure out the final part right away, even if you could see the whole maze. That's the beauty of it, though. The final part is always the trickiest. If you solved the Visible Lock, you'll know what I'm talking about. The Labyrinth Puzzle had me "puzzled" for a while. It didn't take me long to solve it, around half and hour or so, but for the most part, I thought I had it almost solved, when in reality I was very far from it. You can see in the picture below that the coin is almost at the end of the maze, but it's not enough to remove it... And here lies the genius of the puzzle, having you believe you're almost there and a feeling that it's just a little more effort. (Click to Enlarge) - Almost there... Or am I? In fact, I stumbled on the solution almost by accident when I was holding the puzzle at a different position (I'm not saying which one). I was very surprised to see the coin free in such an unexpected way. I won't go into more details about the solution, because I believe that if you find out for yourself, the feeling will be much more rewarding. I'll just say that it'll leave a big smile on your face when you solve it. It's definitely worth it. 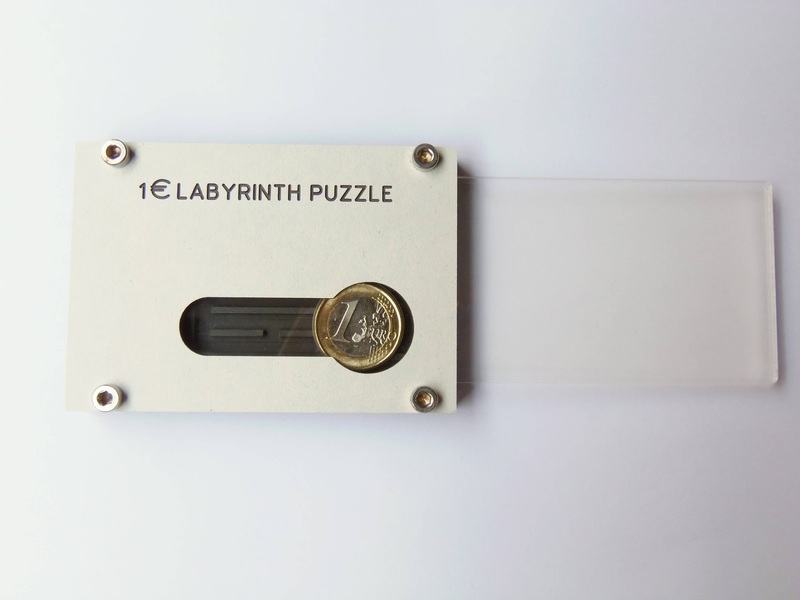 If you own any of Robrecht's puzzles, then you're gonna love the 1€ Labyrinth Puzzle. It has everything you want in a puzzle - Great design, superb quality, and above all, a wonderful solving experience with that a-ha moment as the icing on top. 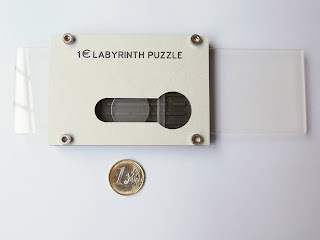 Availability: You can contact Robrecht Louage directly at his e-mail "rlouage(at)telenet(dot)be" to get a copy of his 1€ Labyrinth Puzzle or to ask for availability on some of his other great designs. Mickey is another cute design by Jean Claude Constantin. 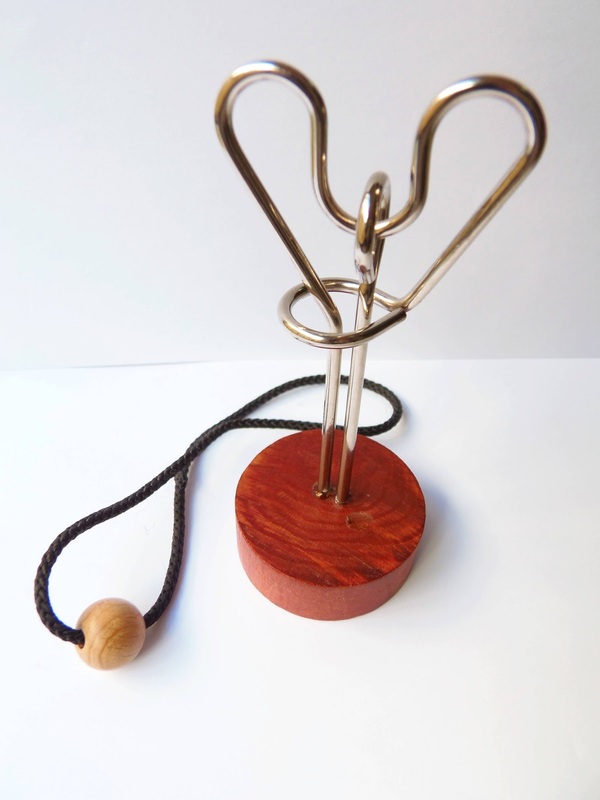 This little puzzle looks harmless, but like all string puzzles it can become a knot fest in no time. Read further as I share with you my experience with this little devil. Just like most puzzles by Constantin, the design is quite original. The metal frame, as the name suggests, resembles the shape of Disney's character Mickey. The frame is comprised of two small loops perpendicular to each other, and a string with a bead at the end. The goal, as you might've already guessed, is to remove the string. It's a small puzzle, measuring only 11.5cm (4.5") in height. I remember trying to solve a similar puzzle, the Hangman, a few years ago, when I first started collecting these fascinating objects. The design was different, but the concept had a few similarities. I remember I didn't solve that puzzle at the time, but as I got more experienced with puzzle solving, I figured this one was worth a shot. To my surprise, I was able to solve Mickey in just a couple of minutes. While the two frame loops look intimidating at first, it's clear that they're part of the solution, so it didn't take me long to discover the solution. Now, like most puzzles in this category, removing the string is just half of the challenge. Returning it to its original position, however, is usually the trickiest part, and this one is no exception. Suffice it to say, my fear came true when all of a sudden I was faced with all these knots. I just couldn't understand how removing the string was so easy, and now, supposedly doing it backwards was so damn hard. I eventually undid all the knots, but as of the writing of this review I'm still unable to return it to its original state. Also worth noting is that the solution, which I tried to use, is completely useless, because it's not shown in steps - Just two images with multiple string positions, harder to decipher than the Da Vinci code... And yet another one to the pile of unsolved string puzzles. Solution: If you get stuck with Mickey, try to decipher its solution here. Availability: PuzzleMaster is a great place to get your Constantin puzzle fix. You can find there the Mickey and many other of his designs. The Cast Enigma is probably one of the most elegant puzzles in Hanayama's Cast series, alongside the Cast Radix - Their design is pure art. The Enigma is an original design by Eldon Vaughn, patented in 1975, and Nob Yoshigahara gave it new life in March 2004 when he decided to add it to the popular Cast series. The key word for the Enigma is "twist". The puzzle consists of three distinct parts - When I first looked at the puzzle I immediately thought about musical instruments, specifically a horn - All three parts must come apart and then should be put together again. This task is anything but simple and you should prepare to be extremely frustrated with this one. Regarding difficulty, the Enigma is in the group of the most difficult ones by Hanayama. Its rating of 6/6 should be an indication of what to expect, although I must say, this is no Cast Nutcase or even the Vortex (the two most difficult in my opinion). It doesn't mean that I didn't have a hard time with it, because it got pretty frustrating at times, but I always felt that I could solve it if I was a little more persistent. I lost count of the times that I tried to solve the Enigma without success, but it wasn't in a couple of sessions, that I can tell you. 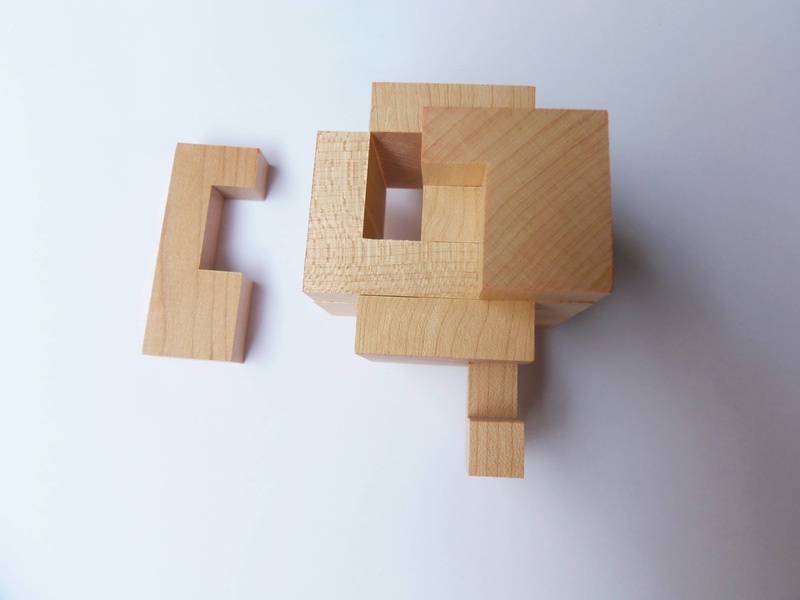 At close inspection, it's easy to see which piece is the key to solve this challenging puzzle, as it's the only one that has a small path to let the other two pieces slide from one end to the other. Figuring this part is easy, but how do you go from there? The remaining pieces were giving the same headache just like the whole puzzle. I was constantly passing the gap of one piece through the path of the other back and forth, but the result was the same. Over 10 minutes passed until I was finally able to get the final two pieces to come apart. Since I was still so frustrated by the whole event, I couldn't get my mind wrapped around the fact that I had to do it all over again, this time in reverse, to get the puzzle back to its original form. I had to resort to a video showing its reassembly and be done with it. I have mixed feelings about the Cast Enigma. On one hand, there's this harmony between the parts that almost feels poetic - The design is indeed a masterpiece. However, on the other hand, I felt like throwing it out the window on my most frustrating moments. It was quite rewarding seeing it solved, though, so I guess it's worth it. Be advised, this is one hell of a challenge. Availability: I got the Cast Enigma from Sloyd, in Finland. They also carry the entire Hanayama Cast Series. Hanayama Cast (in English) - Very useful website in English, with plenty of information on all things Cast. 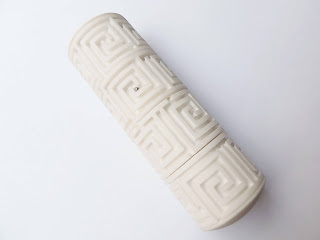 UPDATE (April 2016): It's been over three years since my original review of the MazeRoll. This time, I added a blue companion to the pale white and the result couldn't be better. 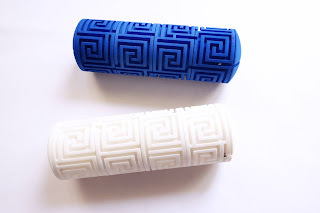 Besides the obvious challenge of making different patterns using the interchangeable parts (both puzzles have identical mazes), the blue one is actually much better in terms of quality, as the small metal sphere navigates much more freely inside the maze's walls. You just need to watch out for the impossible configurations, but that's part of the challenge. You can always turn to the included challenge guide to make many different challenges, but making your own and discover how to solve them adds to the fun. Availability: You can find the blue MazeRoll and other puzzles from Splinter Spierenburgh at MFAVE's website. What happens when you combine a widely known concept with style? 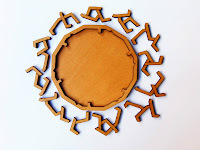 - Splinter Spierenburgh's latest maze puzzles answer this question quite gracefully. Splinter is a Dutch engineer with a great passion for mazes. Before venturing into the physical world of mechanical puzzles, he self-published an e-book with 20 mazes, which you can buy here, for just €2. 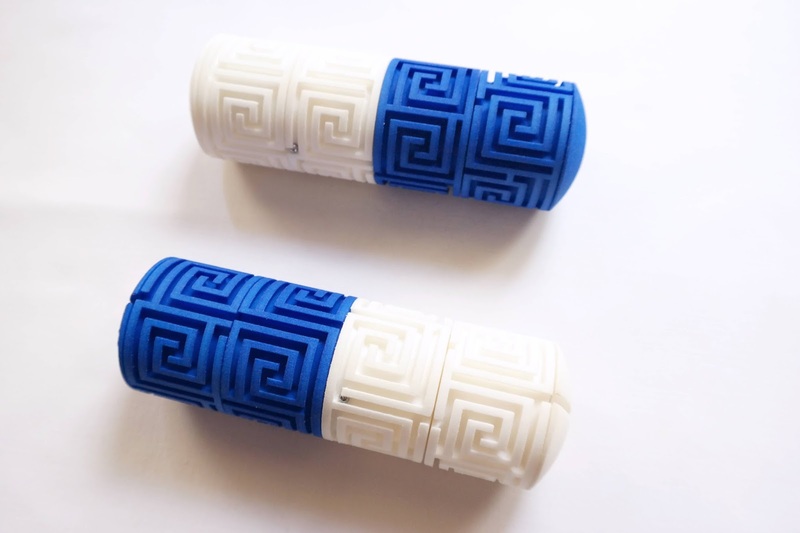 His first three puzzles (MazeRoll, MazeBall and MazeCone) are 3D-printed by Shapeways and their design is reminiscent of Egyptian patterns - simple, yet showing a visual and geometric brilliance seldom seen in puzzle design. Today, I will be focusing on the MazeRoll, which I found to be a fascinating little puzzle. With a length of about 14cm and a 4.5cm diameter (5.5" x 1.8"), the MazeRoll is more than just a simple maze puzzle. Thanks to its clever internal mechanism and design, which I will explain in more detail below, there are exactly 384 possible combinations, although 48 of them aren't solvable. The combinations are grouped by three levels of complexity (easy, moderate and difficult), so it can easily cater to all types of puzzlers out there. 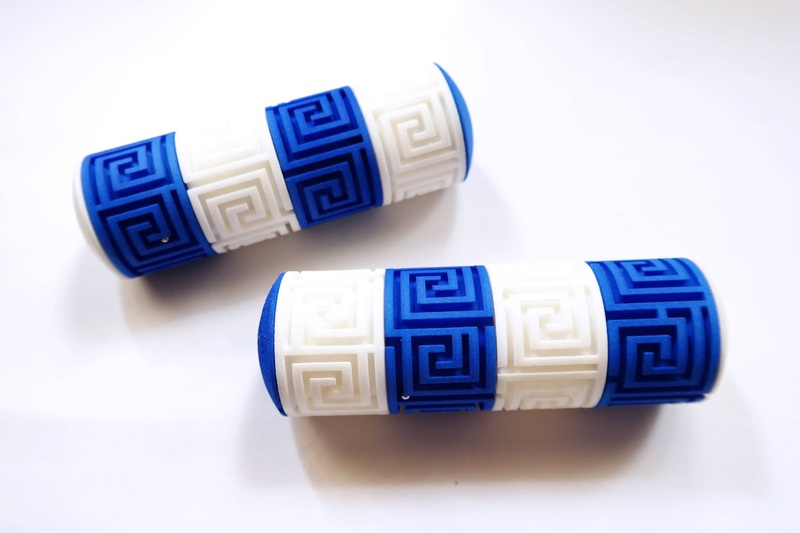 The MazeRoll consists of four disks, each with different paths that, when connected, form a unique maze. The goal is to make the small sphere go from one end to the other. Simple, right? 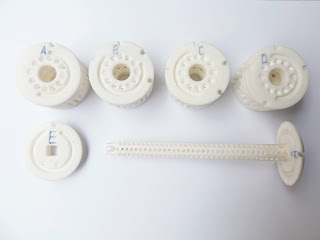 - What's interesting about it, though, is that the disks rotate, but not to a full 360º, because they have small pins that restrict some movements. Add to this the opportunity to rearrange the disks in dozens of different combinations and you have a real challenge in your hands. Another great feature of the MazeRoll is that once you solve a particular maze you can easily return the ball to the start of the maze thanks to an internal straight path that goes through the entire cylinder. This way, you can try and beat your own time or someone else's. Setting up the puzzle with a new maze couldn't be easier. 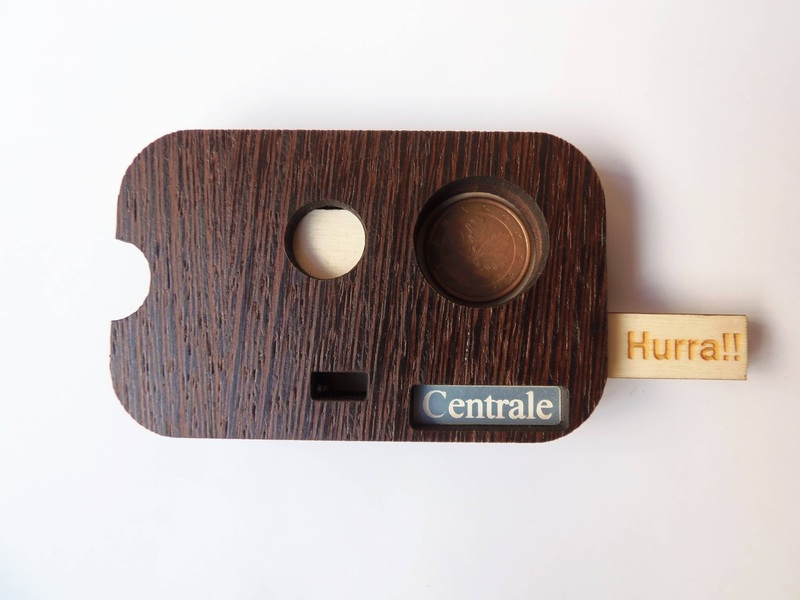 The cap comes off effortlessly and the disks slide off with ease from the central shaft. Here, you can just randomly rearrange the disks to try your luck or use the MazeRoll configuration guide to choose from any of the possible 384 combinations. The disks are labelled with letters, even a 5-year-old could assemble it. There's plenty of challenges here to keep you occupied for a very long time. I tried several different combinations in all three difficulty levels and at first I thought: "How hard can it be to navigate the ball from one end to the other? The maze looks quite easy". Soon enough, my thoughts proved to be quite wrong, actually. 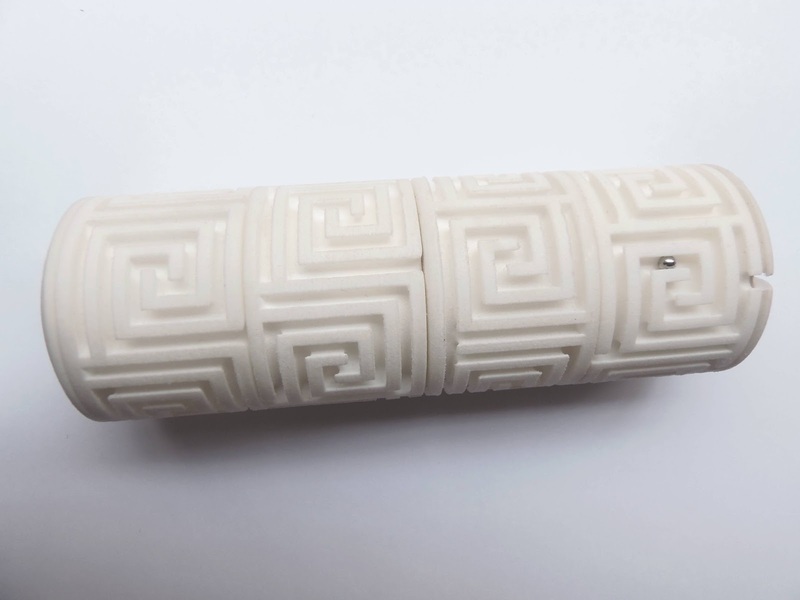 The overall appearance of the maze does make it look easy, and the pattern looks the same all around at first glance, but when you first try to get that small sphere through those apparently similar square spirals, you're in for a treat... The first time I tried it, as I like a good challenge, I went straight to one of the difficult mazes. The real challenge began when I tried to pass the ball from the first disk to the second. Those internal pins that prevent the disks from rotating fully surely did their work. I hit several dead ends and had to go back and forth between the four disks until I was finally able to bring the ball to the exit. I probably took around 10 minutes or so to solve the first maze, and even though it doesn't seem much, compare that to about a minute or less it takes to solve one of the easy ones and you can see how hard it gets. With practice, though, you can reduce that time, as you become more familiar with the workings of the puzzle, but keep in mind it never gets easy, just "easier". If you ever got frustrated by the hidden-maze puzzles out there, i.e. the Revomaze or Dael 'O Ring, the MazeRoll is recommended for you. If you just like mazes in general and can't get enough of them, then the MazeRoll is most definitely recommended for you. If you even remotely like anything that can challenge your mind and keep you busy for a while, I can't see any reason why you wouldn't like the MazeRoll. 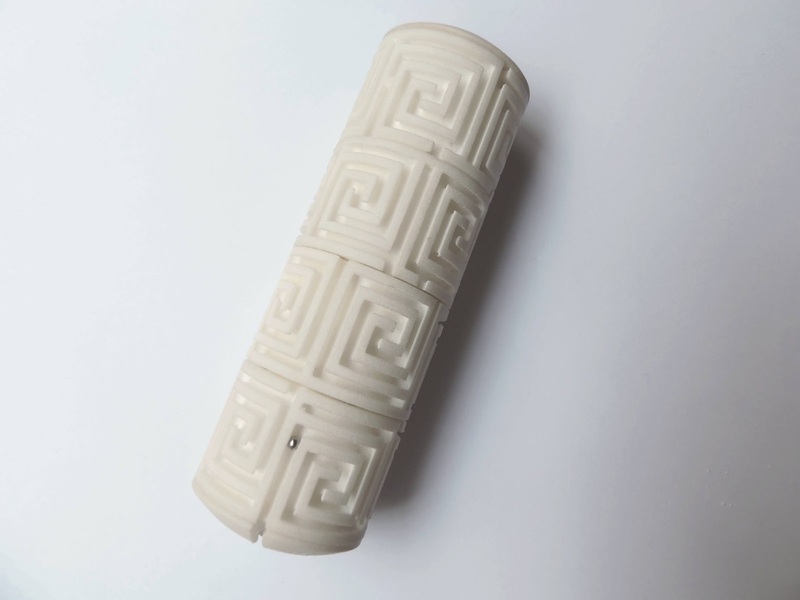 The design is flawless and the Shapeways quality is unquestionable. The price tag might be a bit high for some, especially the casual puzzlers, but to me that's the only drawback. My only request, if these puzzles ever get mass produced, is to have the choice of more colors - It would be great to have an orange/blue color combo. 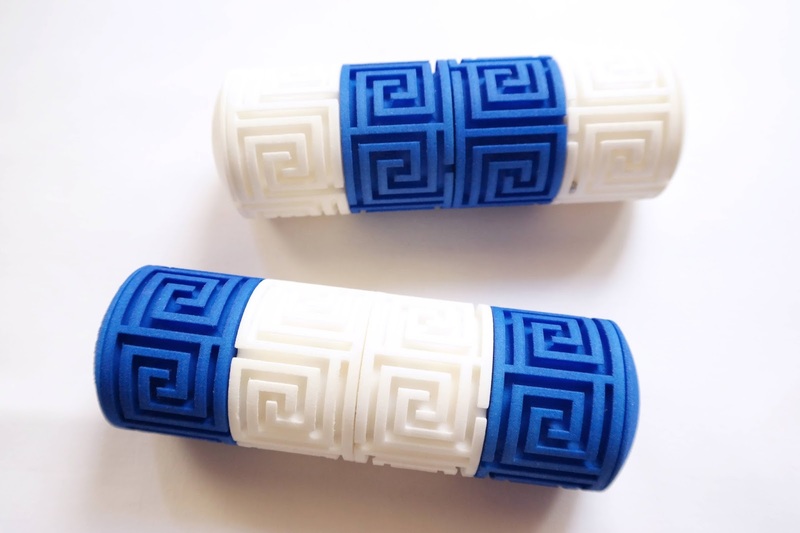 Availability: You have two options if you want to get a copy of the MazeRoll or any of the other two mazes from Splinter: The first is to order directly from Shapeways. Note that these puzzles come in a model kit and you have to assemble them and make some final touches in order to make their movement smoother. 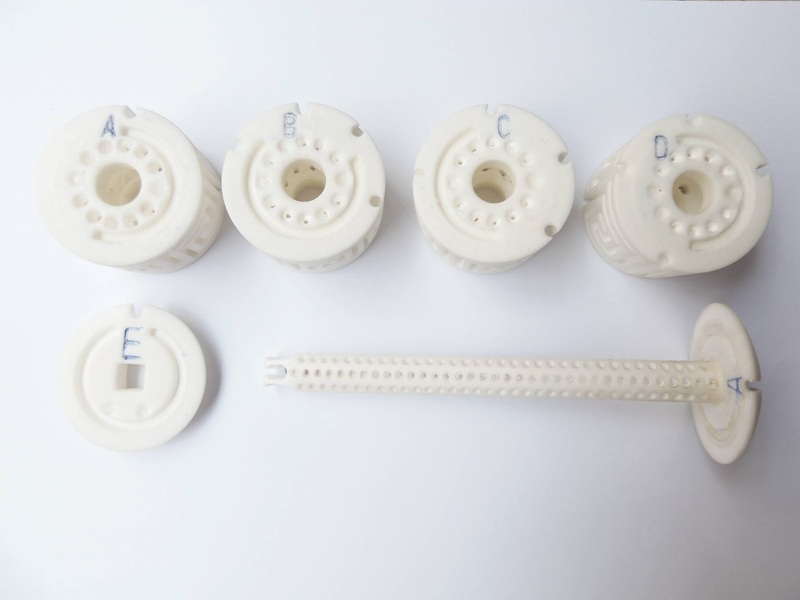 It's also the cheapest option; The second option is to get them already assembled from MFAVE with all the extra work done. This is a bit more expensive and also takes more time to ship, so unless you really don't want to deal with Shapeways, go for the cheapest option. This is my third review for the Paradigm Puzzles collection, manufactured by Family Games America and designed by William Waite. 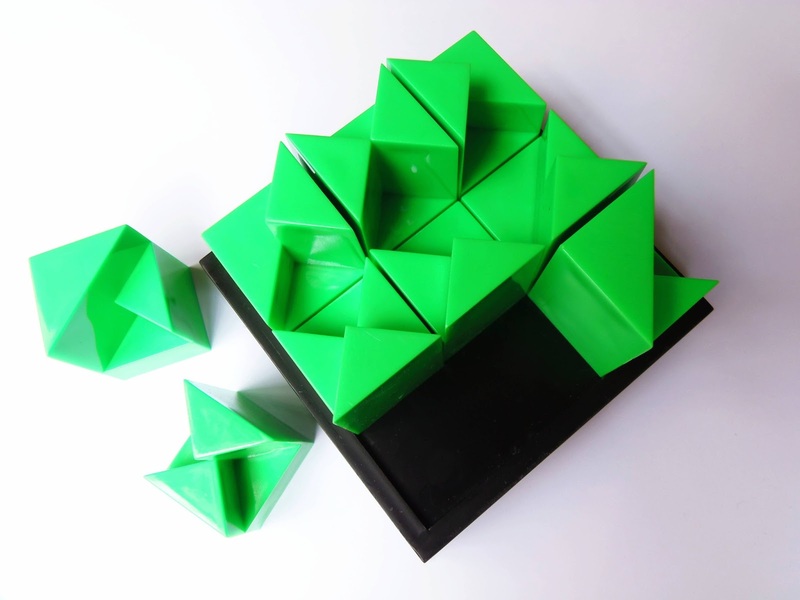 The collection features six packing puzzles, each with a beautiful pattern and complex geometry. This time I chose the Interlace Diamond, based on an Arabic pattern. The puzzle consists of 12 different laser-cut pieces that need to be packed inside the wooden frame. Actually, they don't need to be packed, because the puzzle is shipped in its solved state. It's not a major spoiler, though, because you can't see the outline of each individual piece. It's up to you to find the courage to remove the pieces and try your luck. When solved, the appearance of the puzzle is rather attractive. The pattern is comprised by hexagon shapes repeated throughout the frame and overlapping each other in about 45 degrees creating this mesmerizing mesh of interlacing lines. The pieces are a bit on the small size, but I'm sure you won't have any problems packing them. The tray measures about 11cm in diameter (4.3"). The Interlace Diamond is quite a difficult puzzle to solve. It's rated as a level 8/10 and from what I experienced it's just about right. 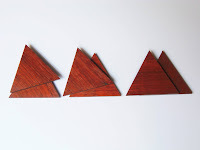 As you can see from the photo below the pieces are cut in very odd shapes and this makes your task quite challenging. The first part is to correctly place the first piece. While this sounds like a simple thing to do, it's actually a bit tricky to get a feel for the correct orientation of each piece. By the way, the pieces can only be used on one side, since the backside does not feature the same markings found on the opposite one. It's because of these markings that it's extremely difficult to see the outline of the pieces when the puzzle is on its solved state. After you get the first couple of pieces seemingly correctly placed, the puzzle will get progressively easier. On a side note, I say "seemingly", because it might happen that your first pieces, while fitting correctly in the tray, may not belong there, and you need to swap them with other ones. Assuming you got the first pieces right, it's just a matter of persistence and patience until you manage to solve it. It took me about half an hour to finally place the 12 pieces on the frame. Excluding rotations, I believe this has a unique solution. 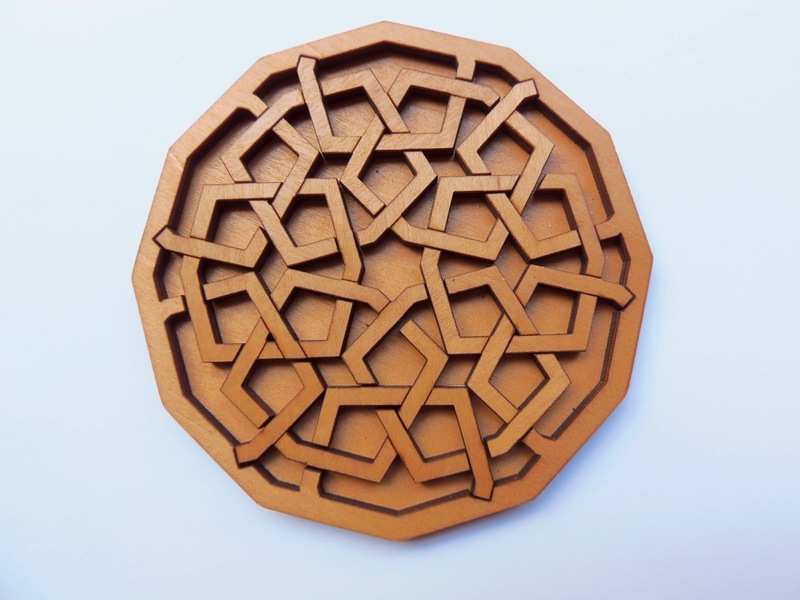 William Waite is a great craftsman, and the Paradigm Puzzles are a great example of his magnificent work. Although the Interlace Square is still my favorite in the collection, the Diamond is a close second. If you can, and if you're into packing puzzles I really recommend the whole collection - It's worth every cent. Availability: The Interlace Diamond, as well as the other five in the collection are available at PuzzleMaster for $18 CAD each, with a couple of them only at $15 CAD. My previous review was about the Cast Nutcase by Oskar van Deventer, and this week I present you yet another one of his genius creations, the Cast Chain, released by Hanayama in July 2002. Although it's another level 6/6 puzzle it's much easier than the Cast Nutcase, which is a relief. 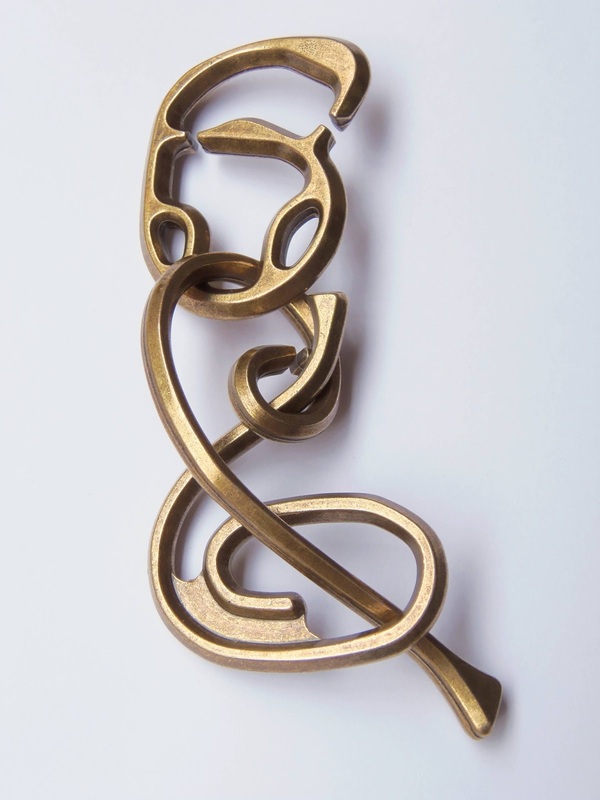 The key word for the Cast Chain is simply "chain". Visually not so appealing like other notable Cast Puzzles, as the Radix or the Marble, the Cast Chain makes up for its concept, which is quite interesting. Maybe a different coating finish would've helped, with two or three contrasting colors (golden, silver and bronze). The puzzle consists of three different pieces that are linked together and move around relatively free, except you can't separate them that easily. Each piece is different and at close inspection you'll notice they have these notches that are essential for you to free them. 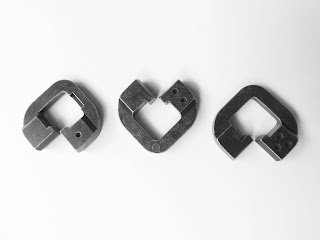 Curiously enough, the Chain has three possible solutions, depending on which piece you choose as the middle one. This is, more or less, what you'll read in the provided description of the puzzle, but I prefer to look at it in a different way, at least from what I experienced. It's more like what piece you happen to get in the middle, as opposed to what piece you choose to put in the middle - Big difference. Moving the pieces around is not as easy as you'd expect, but as you discover how they interact with each other it becomes easier to do it. Swapping the order of the pieces is a bit tricky, but I'm going to try and explain. First you start by joining the two pieces from each end (this is done by aligning the extremities of each piece making a two-by-two square). 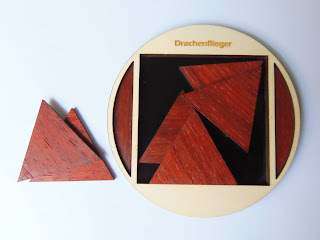 After this, the pieces look a bit more entangled, but if you now do the same procedure with the middle piece and one of the other two, you managed to change the order of the pieces. 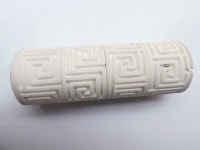 To help you locate where each piece is at all times, they were marked with spots on one of their extremities, which may have one, two or three spots. After having written many reviews for Oskar's puzzles I am running out of adjectives to describe his genius. Each of his puzzles has its own personality and the Chain is no different. Such an original design, it's a shame Hanayama didn't put that much work into its visual appearance - It could have been much better. Availability: You can find the Cast Chain and all of the others in the series at Sloyd, in Finland. Worldwide shipping available. On the Level, by Mag-Nif, is an interesting twist on edge-matching puzzles. If you're familiar with this type of puzzles, most of them are comprised by flat pieces with different colors or patterns. On the Level is a bit different by taking the edge-matching concept to the "next level". 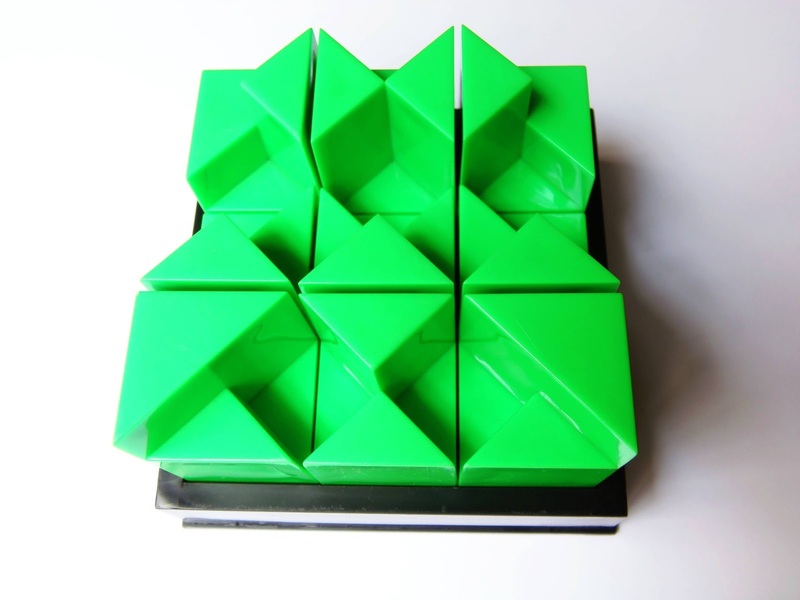 Instead of flat pieces, the puzzle consists of nine tiles, each with three different levels, featuring all nine possible configurations. Although the edge-matching concept is very simple to understand, I found this puzzle a bit confusing at first. I didn't know exactly how the pieces were supposed to be placed. The trick here is to look at the puzzle as if you were seeing it from the top with three different color tones: the highest level being a lighter tone and the lowest level the darker tone. The goal is to have each level of a particular piece match the same levels of its adjacent neighbors, while the outside edges of the 9-piece square match the opposite edge levels. You can see one of the possible solutions below, but there are many more. The pieces also have curious arrangements. Six of them are pairs of mirrored images of each other and the remaining three are mixed combinations of opposite level heights. It might not help you much finding a solution, but it's nice to know your puzzle a little better. Once you understand how the puzzle works it's not very difficult to find a solution. In fact, many of the possible solutions derive from others by simply removing the end columns or rows and placing them on opposite sides. Take a look at Jaap Scherphuis' site. He's done a great analysis on this puzzle. Even though the idea of the puzzle is quite original and fun to solve, its design could have been a little more thought out, as the colors are too bland with the black tray and the green pieces. Other than that, On the Level is a welcome addition to the edge-matching family. Its multiple solutions will sure keep you busy for a while. Availability: You can get the On the Level puzzle at Brilliant Puzzles for about $15 USD. You can also find there two others from Mag-Nif, The Brain and the Cerebral Rings. There's nothing better than to start the new year with a puzzle review from my favorite designer, Jean Claude Constantin, of course. The first review of 2013 is for his packing puzzle Drachenflieger, which literally means "hang-glider", given the triangular shape of the pieces. The puzzle appears to have six pieces, but it's actually only three pairs of triangles that are just glued at different angles. 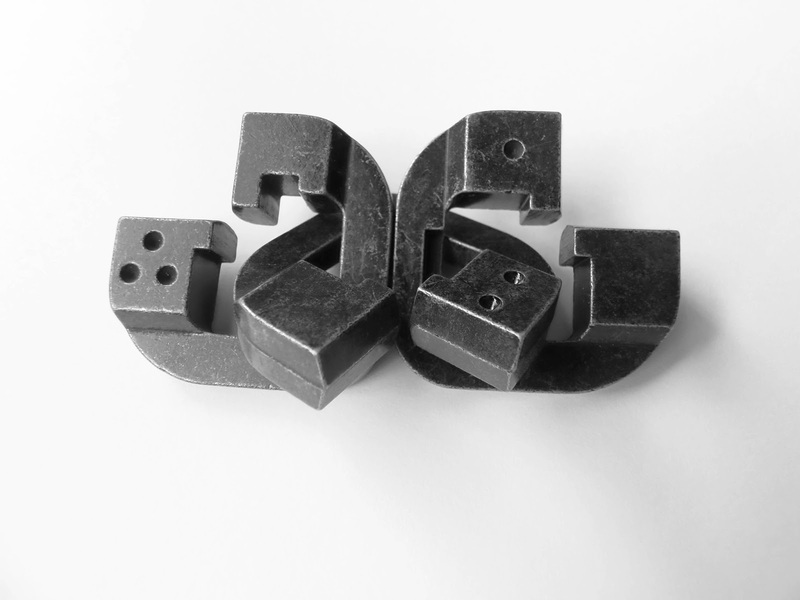 All three pieces are dissimilar and double-sided, giving you twice as much possibilities. As for solutions though, I believe there's only one if you don't count rotations. 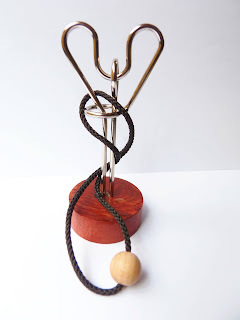 The design is simple, but quite elegant. 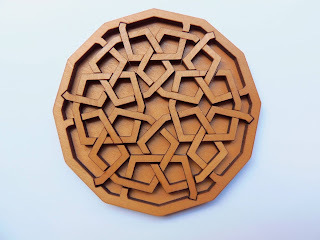 The tray is a perfect circle made from what appears to be plain MDF, and the pieces, made from a stronger type of wood, have this dark tone that makes a nice contrast with the MDF. Its dimensions are 13 x 13cm (5.1"). Sadly, the puzzle comes already packaged in its solved state, which is bad if you want to solve it without any clues. Fortunately though, once you remove the pieces and shuffle them a bit, it won't be an easy task getting them to fit inside the frame again. This is rated by PuzzleMaster as a level 8/10, and I completely agree. How can only three pieces give you so much trouble? - Thanks to the pieces' configuration and the small frame you have to work with, this is one hell of a challenge. First, part of the pieces can be slid over and under each other, which adds for the complexity of the puzzle; and second, having double-sided pieces doesn't help a bit. Once the puzzle is solved, there's almost no wiggle room for the pieces to move. Solution: Click here to see the puzzle solved. Drachenflieger can be quite deceptive. It looks like a simple puzzle with only three pieces, but soon becomes this fiendish challenge that can have you screaming obscenities at it. Expect to dedicate, at least, over an hour of your time to solve it. 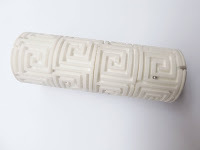 Availability: PuzzleMaster is the place to find many of Constantin's designs. The Drachenflieger is available for $18 CAD.